Amazing and Atopic: Modern Medicine - Sometimes You Need the Strong Stuff! As I discussed in It's a team effort, but you're the captain, each specialist is going to attribute the symptoms to something in their area of expertise. 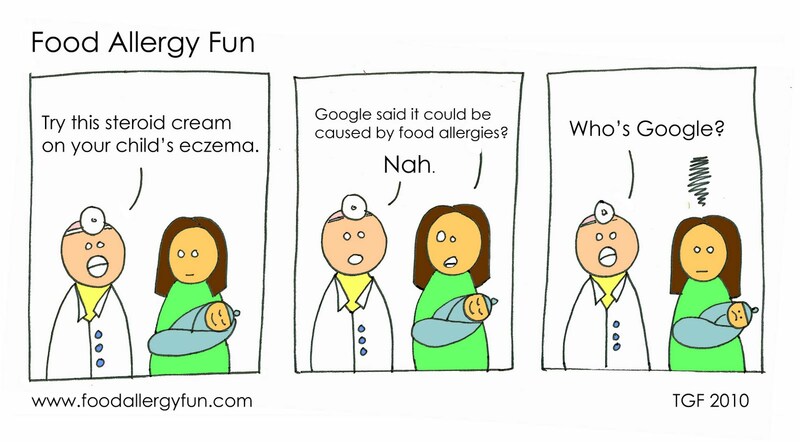 I used those steroid ointments for quite a while before finding out about her food allergies, but hopefully there won't be any lasting ill-effects. I only used them on the worst spots and they have been shown to be safe with sporadic, targeted use. My daughter seems to get the "rare" side effects more often than not, so we try not to add on too many unnecessary medications (like Singulair), if we can avoid it. Now, with that being said, there are times when it is just plain necessary. There is no time for dietary adjustments, lifestyle/environmental changes, homeopathic remedies, etc. Sometimes, you need the strong stuff. When my daughter starts breaking out in a rash and starts getting that "itchy" look about her, I give her a little Benadryl. When she starts wheezing or coughing excessively, I give her a Xopenex treatment. 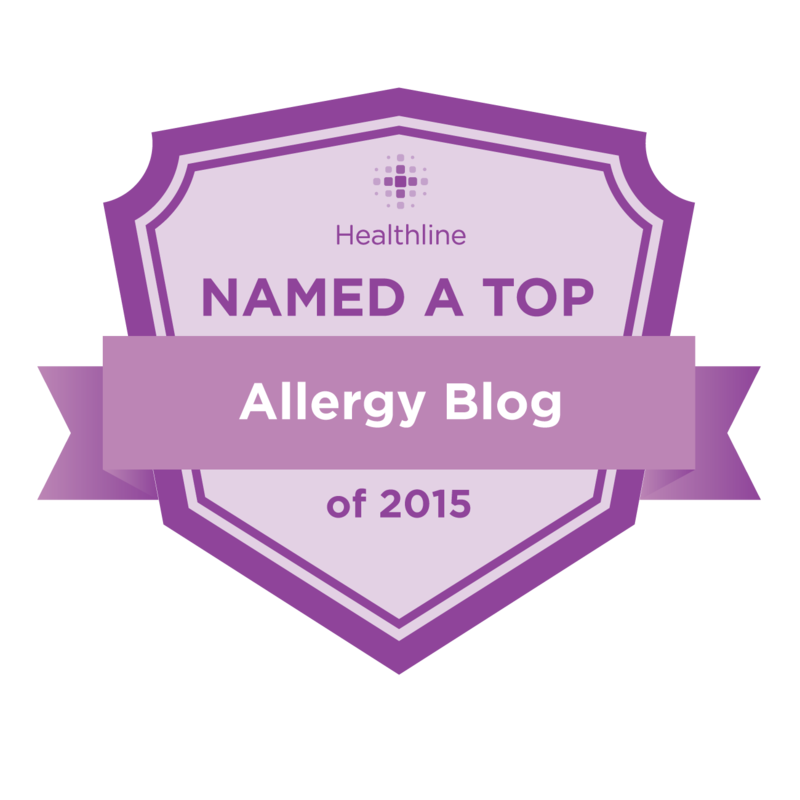 (We greatly reduced the need for Xopenex/albuterol, by starting on Qvar.) It's not a daily occurrence, thankfully, and it helps her breathe properly, which is one of things you want for your child. I do my best to monitor her diet, give her probiotics, keep her skin nourished, and do what I can to keep her healthy in between, but when she is exposed to an irritant/allergen, and medication becomes necessary, then I am going to give it to her. When breathing becomes an issue, or her systems start to react, time is not always on our side. We don't always have the luxury of going the gentle route. Sometimes, you need the strong stuff. I keep repeating that, because I think there are many people who feel hesitant and feel bad when they have to give their child medicine. My apologies for the "ouchie" of an image, but my purpose is to show, first of all, how serious complications from eczema can become and, second, how sometimes you need to bring out the heavy artillery to fight it. 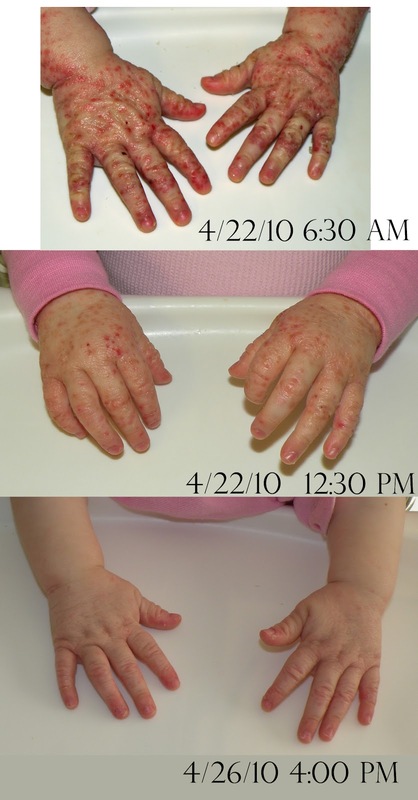 We can certainly do our best, on a daily basis, using natural remedies and products, such as those that can be found at The Eczema Company, but don't beat yourself up if you ever have to give your child a potent "modern medicine" like a corticosteroid, or Benadryl, Allegra, Zyrtec, or any of the other medications that our atopic children (or any children with medical conditions, for that matter) may need over the course of their treatment. Great post! I was just feeling guilty, which I know I shouldn't, about giving my son some antihistamine when he broke out with an intense itch. Exactly to your point, yes, there are times when the strong stuff is necessary. Amazing. I wonder how it the steroids (Prednisone? ), which reduce inflammation--a natural reaction to fight infection--helped kill the staph bacteria. The bacteria must thrive in inflamed skin. It was so long ago and I meant to dig up her medical records, but I believe they also did a course of antibiotics. I believe the steroids helped speed up the healing process and were not used alone. It was Orapred (prednisolone), though. Poor sweet girl! 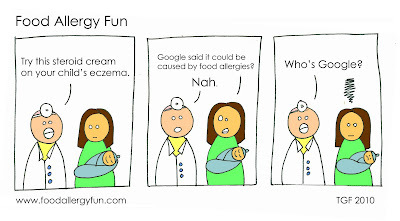 My daughter has terrible food allergies, but we have been so lucky to stay away from awful skin reactions like that...most of her reactions are anaphylactic, or temporary hives/skin issues. So sad to see a sweet little girl with owie skin like that!